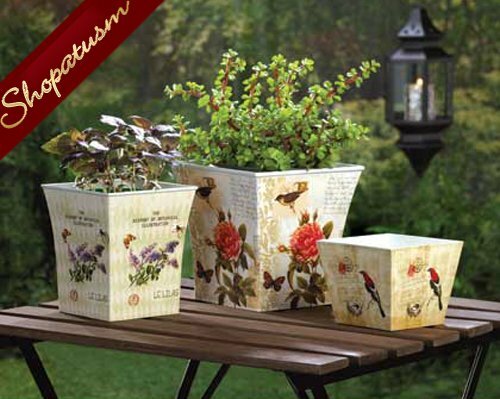 Three delightful planters decorated with the splendor of a busy garden. Each one has a vintage-inspired botanical illustration featuring butterflies, birds, and blooms in striking colors that will multiply the beauty of your growing greenery. Item weight: 3 lbs. Large: 7 1/8 inch x 7 1/8 inch x 7 inch high; medium: 5 5/8 inch x 5 5/8 inch x 6 1/4 inch high; small: 5 inch x 5 inch x 4 inch high. Plastics and calcium carbonate. Plants not included.